I’m all about reading books and enjoying the unique powers that they provide. Because of my personal love of the written word, I often take candid photos of others reading in interesting places. So when I saw a woman reading while sitting across the aisle from me on a commuter train outside of Washington D.C., I was intrigued. She was not just reading; she was fixated on the book in her hands. 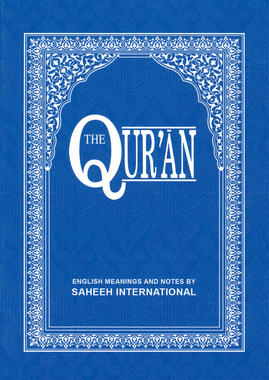 The intensity of her focus upon “The Qur’an,” the holy book of Islam, was remarkable to me and made me smile. Clearly, she was deeply studying that ancient book and enjoying its inspiration. I also was struck by the number of bookmark tags that she had sticking out of her book in every direction. As you can see, there were perhaps thousands of tags in the book’s 800+ pages. 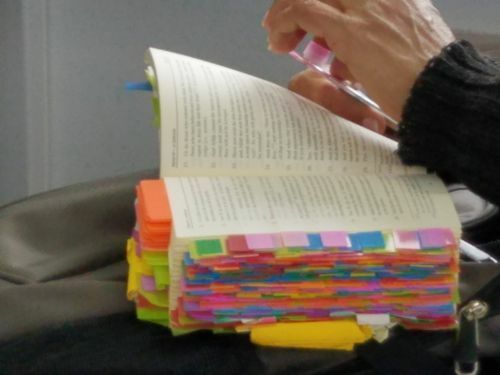 As the train stopped along its route, with passengers getting off and new ones boarding, she remained totally in her own world, reading something, selecting a particular color of sticker and attach it to the page margin. It was clear that for her, the book had become a singular reference volume, and she was in the process of creating something new, unique, priceless and utterly personal for herself. There were clearly thousands of hours of attention and intense thought conveyed by those little markers. While I was intrigued, I didn’t introduce myself to this person for fear that I would have interrupted her complete concentration. That felt wrong. Like bookmarks in a Bible, the jottings on a copy of the U.S Constitution or The Federalist Papers, or underlining in a copy of “The Sayings of Confucius,” each of us who leaves marks on personal copies of venerable documents capture and insert our own perspectives and objectives. My wonderings about the elegant, very western-looking, middle-aged woman reading on the train are unlikely to be very accurate. But, I saw her as a one in a million who had found something so comprehensively important that she was driven to make it her very own. Just as each reader makes a unique sense of any book, another observer would no doubt have read her differently. While she was deeply studying an ancient text, I was reading a mystery which effortlessly took me on a mini-vacation from my daily duties. 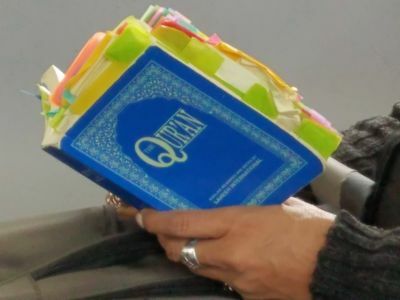 The Qur’an was for her a life’s treasure, a one-of-a-kind keeper, contributing to a unique spiritual growth that she was crafting in a labor of love. Mine was a read-and-then-share temporary pastime. So what’s the take-away? I believe it is that every book can deliver a broad range of positive results, each discernible only to unique individual readers who read it from their different life perspectives, and driven by their immediate objectives. Our job is to not only discover this for ourselves, but to invite young readers to discover it for themselves, too. That takes me back to many a classroom filled with my own students. I smile about myself now, this time thinking of the diversity among individual students I had in class over the years, all reading what I naively thought at the time was the same book I had assigned.